As we approach the season of giving, it's time to give green fashion a go. Join us November 29th for a fabulously fun, eco-friendly fashion extravaganza! 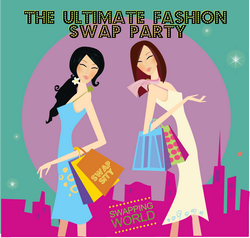 Swapsity is thrilled to be hosting a high-end clothing swap as part of Fashion Takes Action's Shop Sustainable: Eco Friendly Marketplace and Clothing Swap . Save yourself an expensive trip to the mall and enjoy a day of trying on high-end clothes, draping yourself with accessories and mingling with other swappers just like yourself while sipping a glass of wine. This is your chance to update your wardrobe without being asked, "Paper or plastic?" You'll be shopping sustainably, having fun and scoring some fabulous finds as your own pre-loved items will get a new lease on life. Put this event in your calendar and start searching for all of the high-quality tops, dresses, pants, jackets sunglasses, ties, or purses that are swap worthy and ready for a new fashion-loving owner. Tickets: Fashion items can be dropped off early with Fashion Takes Action team or brought on the day of the swap to the Swapsity clothing swap. TIME: Mon-Wed 9:30a.m. - 4:30p.m. ; Thurs 10.00a.m.-6:00p.m., Saturdays 10a.m.-3p.m. 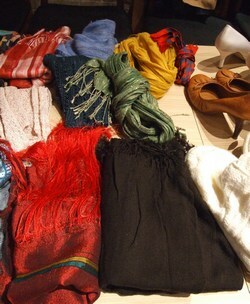 Items to swap can be brought to the event, but only advance drop offs will receive a free drink ticket (valued at $5). You can bring clothing (no underwear) scarves, belts, gloves, shoes, bags, handbags, hats, ties, coats and other fashion accessories. Jewellery will not be included in this swap event. 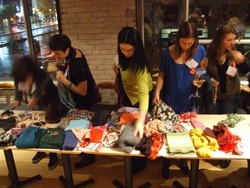 Check out the photos from our September fashion accessory swap. Bring at least one item to swap. It can be a piece of clothing or a fashion accessory. You can bring up to 25 items to this eco-event. 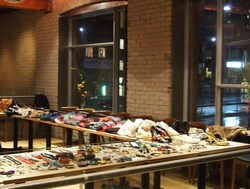 Each item dropped off at the swap will be considered to have a value of 1 token. All clothing items must be freshly CLEANED (washed in hot water and dried or dry cleaned). Items must be smoke-free and in good condition. We will not be accepting jewellery for this swap event. If we feel the item is unsuitable, we may not be able to include it in the swap. One item equals one token. You will be able to take the same token value in items that you have brought. Keep in mind that all swaps are final. 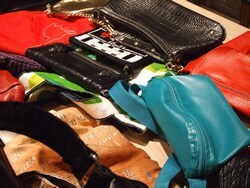 To learn more about our events and sign-up for swap meet alerts visit www.swapsity.ca/meets.